As members of Congress closely examine the Joint Comprehensive Plan of Action (JCPOA) to prevent a nuclear-armed Iran, various assertions are being made. Some questions are based on legitimate concerns, while other claims made by opponents of the deal are based on fiction. We are closely tracking both and offer the following responses, which will be updated regularly. Claim 1: Iran will be allowed to inspect itself. In August 2015 the Associated Press incorrectly reported that a leaked draft of an agreement between the IAEA and Iran indicated that “Iran will be allowed to use its own inspectors to investigate a site it has been accused of using to develop nuclear weapons.” Within hours, experts and the IAEA corrected the record. The authenticity of the document the AP article is based off of has also been called into question; however, according to Jim Walsh, MIT security expert and Council for a Livable World board member, whether the document is real or fake is irrelevant to the primary issue: Iran will not be conducting its own verification or inspections. Claim 2: This agreement prevents the United States from punishing Iran for future violations. No aspect of the agreement prevents the United States from maintaining or implementing new sanctions on Iran for its behavior. The U.S. has made it clear that it will continue to punish Iran for its human rights abuses and support for terrorism. The U.S. has continued to target actors associated with Iran’s terrorism activities for sanctions throughout the negotiations. As Adam Szubin, Under Secretary for Terrorism and Financial Crimes at the Department of Treasury stated in a recent Senate Banking Committee hearing, “Under the Interim deal, while negotiations were ongoing, we took action against more than a hundred Iranian-linked targets, and we will be accelerating that work in the days and months ahead, alongside Israel and our regional allies to combat Iran’s proxies, to interdict funds moving through its illicit networks.” These efforts have continued since the deal was reached. For instance, in late July 2015, the US Treasury Department imposed sanctions on three Hezbollah officials, an Iranian proxy group in Lebanon that is designated a terrorist organization by the United States. Claim 3: Because the President can unilaterally waive all sanctions, the agreement will be implemented whether Congress approves it or not. Furthermore, the onus will be on Congress to approve and appropriate adequate funding for the IAEA in order for the deal to be properly implemented and to prevent Iran from acquiring a nuclear weapon. Claim 4: The United States can convince the international community to continue its support for sanctions after killing the agreement. If Congress were to reject the deal, the United States would need to coerce the international community to continue sanctions against their own economic interests. Some opponents of the deal advocate for threatening the international community: You can either do business with Iran or business with the United States. But this threat lacks credibility. As Treasury Secretary Jacob Lew explained in a New York Times Op-ed, 40% of American exports go to the European Union, China, Japan, India, and Korea. By threatening to exclude these countries from our banking system, the U.S. would be placing a significant portion of its own economy at risk. Moreover, the major importers of Iranian oil (China, India, Japan, South Korea, Taiwan, and Turkey) also account for one-fifth of U.S. exported goods and own 47% of foreign-held American treasuries. Even threatening to terminate this economic connectivity could have negative ramifications for both the US economy and the economies of our allies. Our negotiating partners will not maintain sanctions that hurt their economies simply because the U.S. Congress insists they do so. Threatening our allies with economic warfare is a ludicrous approach, especially when compared to the practical and widely supported alternative of implementing the agreement. Claim 5: The American people don’t want the deal. A consensus of polls suggests that the majority of the American public, and an even stronger majority of Jewish Americans, support the deal. 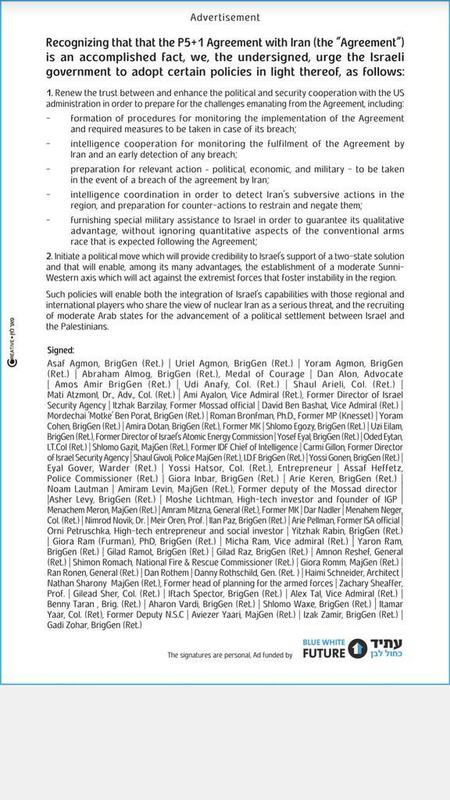 Furthermore, a considerable number of foreign affairs experts and top officials support the deal: more than 100 former US ambassadors, 60 American national security leaders across the political spectrum including former US ambassadors to Israel, 70+ nuclear nonproliferation experts, 73 prominent international relations scholars, 67 Israeli former military and intelligence officials, 34 retired American Generals and Admirals, 32 top American scientists, 340 rabbis, 75 former Senators and Representatives, and the Gulf Cooperation Council, all publicly support the deal. Claim 6: Congress can reject this agreement and negotiate a better deal. If the US Congress abandons this multi-lateral agreement endorsed by the UN Security Council, the next round of negotiations will be the US sitting at a table for one. If Congress rejects this deal, the international sanctions regime that incentivized Iran to negotiate would unravel. Our negotiating partners don’t answer to the US Congress. Russia and China, for instance, won’t continue sanctions on Iran because the GOP says they should. If this were to happen, Iran would receive sanctions relief without having any constraints on its nuclear program. Claim 7: Military action is better than this deal. Taking military action, instead of implementing the current diplomatic solution, would shatter the international coalition that is applying economic pressure and force the United States to confront Iran without international support. Even if a US bombing campaign were effective, it would need to be repeated every few years to prevent Iran from developing a nuclear weapon, resulting in a never-ending game of “nuclear program whack-a-mole.” Furthermore, we would not have the access or monitoring afforded to us under the agreement in order to detect covert facilities. It is important to remember that implementing the Joint Comprehensive Plan of Action does not take the United States military option off the table. If anything, it strengthens it by improving our understanding of the status and location of Iran’s nuclear program. Claim 8: The deal won’t work because Iran is going to cheat. The deal is not based on trust; it’s based on verification. The IAEA will have 24/7 access to Iran’s known nuclear facilities and will be closely monitoring Iran’s supply chain of nuclear materials, centrifuge production lines, and any purchases that might be used for a nuclear program. The deal also provides timely inspections to any undeclared facilities where suspected nuclear activity may be occurring. If Iran does cheat, they will be caught and sanctions will be re-imposed. There are also aspects of the deal that Iran can’t easily undo. Iran must dismantle two-thirds of its installed centrifuges, remove 98% of its uranium stockpile, and permanently alter the Arak Plutonium reactor before it receives any relief from economic sanctions. These actions will be verified by the IAEA and will greatly increase the time it would take Iran to obtain weapons-grade nuclear material. The deal goes to great lengths to buttress major points of the agreement. For example, the deal does not just put limitations on centrifuge production, it also puts limitations on rotor production, and on the machines that make the rotors. The subsidiary commitments that Iran has made for the agreement are truly impressive. Rejecting this deal means no restrictions, no verification, and no inspections of Iran’s nuclear program. Even if Iran cheats, we’ll know far more about Iran’s nuclear activities than we do now. And that will mean that all of the alternatives—including the least desirable, military action—will be more effective. Claim 9: We cannot, and should not, negotiate with our adversaries. Some critics suggest that because Iran is our adversary, we should not negotiate a deal with them. This line of thinking completely ignores history. President G.W. Bush negotiated a successful nuclear agreement with Libyan President Muammar Gaddafi—a sworn enemy of Israel and a state sponsor of terrorism. The Soviet Union had 10,000 nuclear weapons when we started negotiating SALT I. Both of these efforts, like the Iran deal, significantly improved the security of the United States and its allies. This agreement does not rely on Iran changing its behavior. Instead, it includes verification mechanisms to ensure that Iran cannot build a nuclear weapon. In addition, sanctions for Iran’s sponsorship of terrorism and human rights abuses will stay in place. This deal may provide a unique pathway for international cooperation to improve regional and global security by addressing Iran’s other unacceptable policies. If Congress kills the deal, that pathway will be closed. Claim 10: 24 days is more than enough time for Iran to cover up its illicit nuclear activities. First, some context: All of Iran’s nuclear facilities will be under 24/7 surveillance. The deal also provides an unprecedented process for inspecting facilities where the IAEA suspects illicit nuclear activity may be occurring. This means the IAEA can inspect businesses, military facilities, and even the President of Iran’s garage if necessary. The ability to carry out these investigations is permanent, but only if the deal is approved. Under the comprehensive agreement, Iran will implement the Additional Protocol, which sets requirements and provides the legal authority for IAEA inspectors to access all nuclear and suspected nuclear facilities in perpetuity. The IAEA can request access with 24-hour notice to any site inspectors suspect might be conducting illicit nuclear activities. If Iran denies the IAEA access, the JCPOA offers an extra enforcement process to ensure access: a Joint Commission, comprised of one representative from each P5+1 country plus Iran and a European Union representative. When the IAEA or any member of the Joint Commission warns that Iran is blocking access to a suspected site, a majority of members can force the Iranians to allow access. Unlike the UN Security Council, no one party gets a veto on this commissions. That means Russia, China and Iran can’t prevent inspections. This process takes, at most, 24 days to complete. The Joint Commission has a maximum of seven days to review and adjudicate a claim that Iran is carrying out illicit nuclear activities; but if the evidence clearly indicates Iran should open a site for inspections, it could make that decision on day one of seven, bringing the timeframe down to 18 days. The clock starts ticking the moment the IAEA demands Iran give it access to a particular site, including the 24-hour advance notice required under the Additional Protocol. Even the worst-case scenario of 24 days is not enough time for Iran to hide any substantial violations. The half-life of nuclear material is thousands of years. If Iran had material that could be used to make a nuclear bomb at a given location, inspectors would be able to find traces of it. Also, the physical structures to enrich weapons-grade uranium or plutonium cannot be moved in 24 days. During the 24-day period, international intelligence apparatuses will watch the suspected facility to monitor any attempts to hide or move evidence. If, for example, trucks are backed up to a suspected facility, it could be considered a breach of the agreement and sanctions can legally be re-imposed. While Iran may be able to get away with, say, computer-modeling activities during the 24-day period, they will still be a long way away from developing a nuclear weapon (much further than if there was no agreement in place.) To put it another way, if Iran’s goal is to secretly build a car, they may be able to develop a headlight or a windshield wiper without detection. But they will not be able to build an engine or fuel it. And they will still be several long, complicated steps away from building a car that functions. Reminder: no deal means no inspections and no restrictions on Iran’s nuclear enterprise. Claim 11: Sanctions are inadequate for punishing Iranian violations. The Iran deal includes a “snapback” mechanism for re-imposing UN sanctions on Iran if they fail to comply with their obligations. Some critics have argued that the UN sanctions will never be re-imposed due to a lack of political will by members of the UN Security Council. This concern was considered by the negotiators, who implemented a process that works around this potential pitfall. If Iran is found to be in breach of the agreement, a resolution is brought before the UN Security Council to continue the lifting of sanctions. If the resolution is not adopted within 30 days or if a veto is issued, the sanctions are re-imposed. This effectively eliminates the ability of Russia or China to veto the reapplication of sanctions. Another concern is that the sanction system is “capital punishment for a misdemeanor” and fails to provide incremental responses for smaller violations. This is false, as the United States and its partners have several options for responding to an Iranian breach of the agreement without fully implementing sanctions. First, the parties to the agreement can try diplomacy to resolve a dispute. There is a mechanism built into the agreement that permits members of the Joint Commission to meet at the ministerial level to discuss the alleged violation and establish a resolution. If the commission and ministerial-level consultations do not solve the dispute, parties to the agreement may 1) re-implement some sanctions in response to a breach, as is established by customary international law (Article 60 of the Vienna Convention on the Law of Treaties) or 2) implement extraterritorial sanctions outside what is bound by the agreement. In addition, the United States could use their ability to automatically re-impose the full list of UN sanctions as a bargaining tool, incentivizing the UN Security Council to negotiate and adopt a lesser resolution to avoid using the full sanctions to respond to a lesser violation. Iran, like all parties to the agreement, can walk away at any time. But if Iran were to leave the agreement after being punished for violating the deal, the international community would be justified in applying the full weight of sanctions to bring Iran back into compliance. We would then be back where we started before the deal, except that Iran would have considerably fewer centrifuges and nuclear material, while the IAEA will have more insight into the history and current status of Iran’s nuclear program. Critics have also called for a declared matrix of punitive responses to prospective Iranian violations. This would unnecessarily bind the P5+1 to respond to a violation in a specific way regardless of context, taking away the ability to increase or decrease the intensity of the response. Swearing off any tools in our toolkit would not improve this agreement’s ability to deter an Iranian violation. Claim 12: The Iran deal will fail just like the Agreed Framework with North Korea failed. Comparing the agreements with Iran and North Korea is like comparing apples to dragon fruit. They’re both fruit, but that’s about it. For starters, the Agreed Framework with North Korea was four pages long. The Iran deal is 159 pages. The framework with North Korea only addressed the plutonium pathway to a bomb, whereas the Iran deal blocks all three paths to a bomb: plutonium, uranium, and covert action. In addition, the North Korea framework was a bilateral arrangement between the US and North Korea. The Iran deal is inherently stronger because more parties were involved in the negotiations process, and will be involved in its enforcement. Claim 13: Iran’s nuclear infrastructure will cause a nuclear cascade throughout the Middle East. Iran has had a nuclear program since the 1950’s and an enrichment program since the 1980s. Before the interim agreement in November 2013, Iran was enriching uranium up to 20%. If there was no nuclear cascade when Iran’s program was unconstrained and only a few months from obtaining the enriched material necessary for a nuclear weapon, why would it occur when Iran’s program is both constrained and verifiably monitored? Also, the United States provides security assistance to many of Iran’s neighbors and can use this leverage to prevent nuclear proliferation. Saudi Arabia, for example, would likely not risk its alliance with the United States in order to pursue a nuclear weapon to counter Iran’s constrained civilian nuclear program. If Congress rejects the deal, Iran is more likely to pursue nuclear weapons and set off a cascade in other countries. The bottom line is that a safeguarded civil nuclear program does not pose a proliferation risk—it never has in the past 70 years of the nuclear age. Claim 14: Lifting the UN embargoes on conventional arms and ballistic missile technology transfers to Iran will embolden Iran and lead to further instability in the region. The conventional arms and ballistic missile embargoes were adopted as a part of a UN Security Council resolution in 2010. Under the resolution, the embargoes were to be lifted if Iran agrees to negotiate on its nuclear program. This means the embargoes should have been lifted two years ago when Iran signed the interim agreement. Regardless of this and the fact that Iran, Russia, and China all wanted the embargoes to be lifted immediately, the deal maintains the arms embargo for another 5 years and the ballistic missile embargo for another 8 years. This is a major concession on the part of Iran and is meant to incentivize Iran to comply with the terms of the JCPOA. Critics claim that the eventual lifting of these sanctions will facilitate Iran’s “imperial surge.” However, many of Iran’s staunchest foes, including Israel and Saudi Arabia, have much more advanced weaponry than Iran. The United States will continue to offer military assistance to these countries to counter Iran. To counter any expansion of Iran’s military capabilities, the US has committed to continue its security assistance to Israel through arms trades, joint military exercises, and cooperative intelligence and training initiatives. To date, the US has provided Israel $124.3 billion in military assistance. Bolstered by US-developed technology, Israel’s military capabilities far exceed those of Iran. Furthermore, Saudi Arabia spends more than four times what Iran spends on its military. And Saudi Arabia plus the United Arab Emirates, two of the United States’ allies in the region, spend a combined 60% of the Middle East’s overall military spending. In regards to Iran’s ballistic missile program, Iran is still excluded from the Missile Technology Control Regime, meaning it will still not be eligible to receive missile technology assistance. While North Korea may provide ballistic missile assistance to Iran, it was doing so regardless of the embargo, which has no effect on a pariah states like North Korea. Claim 15: Iran will use sanctions relief to pursue regional hegemony and further support terrorism. Iran’s sponsorship of terrorism negatively impacts the stability of the region. But if Iran obtains a nuclear weapon, the nuclear deterrent that Iran would extend to its terrorist allies would pose an even greater threat. This deal eliminates that threat, preventing a dramatically worse security situation. Furthermore, according to a report recently released by the CIA, Iran will use most of the released funds it receives from sanctions relief to bolster its economy, not to aid militant groups it supports. Iran needs to invest in domestic development and reinvigorate its economy. Iranian President Rouhani has promised to revive the economy by completing formerly halted development projects and bringing down the rate of inflation—progress the Iranian people have been demanding. Critics of the Iran deal like to exaggerate the amount of blocked funds Iran will receive, claiming that Iran will receive up to $300 billion in sanctions relief. According to US Treasury Secretary Jack Lew, that figure is more like $50 billion. Iran owes at least $20 billion to China in addition to tens of billions in non-performing (unpaid) loans and has around $500 billion worth of pressing domestic investment requirements and government obligations. Lastly, the Intelligence Authorization bill currently working through Congress requires the Director of National Intelligence to produce a report on how Iran uses their sanctions relief funding. Congress should continue to implement accountability efforts like this, which help to improve U.S. intelligence assessments of Iran and monitor the effects of the deal. Claim 16: There is a secret side deal between the IAEA and Iran. Under the deal, Iran must submit a full report to the IAEA regarding its nuclear history before it can receive any sanctions relief. The IAEA will review the report and follow-up with Iran in order to conclude its investigation. The IAEA has said that it expects to complete this report by the end of 2015. Some critics are calling this a secret side deal between the IAEA and Iran; however, this is standard operating procedure, and every such agreement the IAEA has with other countries is also confidential. This was even true during the IAEA’s inspections into Libya. While the general public is not privy to the details of the arrangement, it is safe to assume that the United States government has been fully briefed on the procedures. The arrangement specifies procedural information regarding how the IAEA will conduct its investigation into Iran’s past nuclear history, including mentioning the names of informants who will be interviewed. Releasing this information would place those informants, and the information they hold, at risk. Others have argued that the IAEA should not be trusted, as no Americans are permitted to inspect Iran. This is because the United States and Iran do not have normalized diplomatic relations, a requirement for an inspector to receive a visa and enter Iran. While no Americans will be inspecting Iran’s facilities, every inspector for the IAEA has gone through extensive training in the United States. Claim 17: The deal, if implemented, will expire after 10 or 15 years and allow Iran to build a nuclear weapon at that time. This does not, however, mean that on day one of year 16, Iran will have enough weapons-grade uranium to build a bomb. Yes, after 15 years Iran could begin enriching uranium beyond 3.67 percent. But without this deal, Iran could head for a bomb tomorrow. Some aspects of the agreement will last 25 years, including the monitoring of Iran’s uranium mines and supply chain. Other aspects, such as the implementation of robust IAEA safeguards and access to investigate suspicious sites for illicit nuclear activity, are permanent. Regardless of what specific restrictions are lifted, Iran is still prohibited from pursuing nuclear weapons. Any activity that is clearly not intended for “peaceful use” (i.e. highly enriching uranium) will raise red flags and trigger a response from the international community. Ultimately, the deal rolls back Iran’s nuclear program for more than a decade, pushing Iran’s “breakout time” (time it would take to enrich enough nuclear material for 1 nuclear weapon) from a few months to at least one year. It also gives IAEA inspectors greater insight for monitoring Iran’s nuclear program well into the future.